1) Inside the Industry: Fratello Cigars has announced its first limited edition offering. 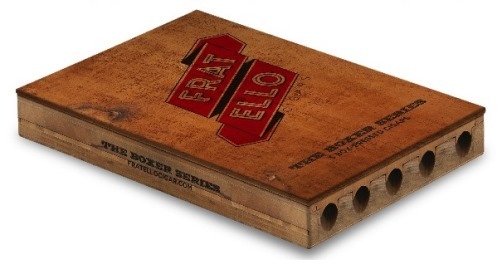 Called “The Boxer Series,” it’s an offshoot of the Fratello Boxer cigar, a vitola in the original Fratello line that came out last year. “We tweaked the Fratello blend, box-pressed the cigar, and people loved it,” said Fratello owner Omar de Frias of the original Boxer. The Boxer Series will only be available as a wooden five-pack that resembles a cigar mold, and only 3,000 packs will be made. Each has four new sizes—Boxeador (6 x 54), Boxero (5.5 x 50), Boxista (5 x 48), and Boxerito (4.75 x 46)—along with one original Boxer (6.25 x 52). The packs will retail for $45 and begin appearing at retailers in mid-November. 3) Trying to track down a bottle of the ever-elusive Pappy Van Winkle now that the annual release of the Van Winkle bourbons has arrived? Good luck. The folks over at Bourbonr may not be able to find you a bottle, but they’ve developed a release map in the spirit of bourbon enthusiasts trying to help each other. They also have a helpful guide on how to hunt bourbon. 4) Free Cigar Giveaway: StogieGuys.com readers who register at CigarsFor.Me this week will once again be registered to win a free five-pack of cigars. CigarsFor.Me specializes in recommending premium cigars after visitors fill out a Palate Profile. It’s fun, easy, and this week you can win free smokes. Click here. And congrats to last week’s winner: Darrylyn B. from Hickory, North Carolina. 5) Deal of the Week: Looking to stock up on lots of cigars for as low as $2.50 each? Check out these mystery grab bags. While you don’t know exactly what will be included, given this list of cigars, you can be sure you’ll be getting your money’s worth. Lawsuits over whatever regs are released for e-cigs and cigars are pretty likely, which would delay them further, so it could be quite a while before anything becomes final. While I believe you’re right that there will almost certainly be lawsuits brought against any FDA regulations, I wouldn’t look to the federal courts as a potential source for relief. Traditionally, the courts are reluctant to get involved in rule making unless there’s clear evidence the regulatory agency has exceeded the legislative mandate. And with the rather vague wording of the Tobacco Control Act, that seems, to me at least, most unlikely. We’ll see. I’m not predicting cigar makers would certainly win, but there is a case to be made, depending on how things are enacted, that broad rules on cigars were not the intent of the legislation. The word “cigars” comes up only once I think in the text of the tobacco control law. I was also thinking that the fact cigars are blended slightly differently year-to-year makes enforcement of cigarette-style rules nearly impossible. At any rate, I’d think those kind of questions raise enough doubts to get a court to delay enforcement, even if the industry eventually loses.